UPDATE 3:35 AM EST. 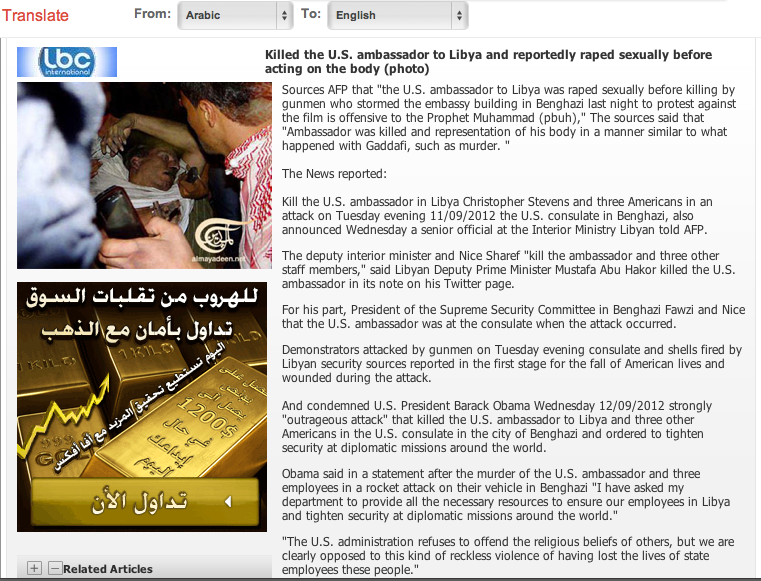 - The Lebanon report on the murdered U.S. ambassador, Christopher Stevens, in Libya remains unconfirmed by the AFP. Greetings, Concerning your query on the report published by a Lebanese website according to which ambassador Stevens was sodomized. That report falsely quoted our news agency and has no truth whatsover to it. AFP promptly sent a strongly worded complaint to that website and they removed the report and published a denial, saying that AFP did not report such a thing. A news report made by the Libyan Free Press was also reporting that Ambassador Stevens was sodomized before he was killed. Their video was removed. QUESTION: Can you explain to us whether you know whether Ambassador Stevens was alive when he was removed and taken to the Libyan hospital or not? And secondly, there are suggestions that he died as a result of smoke inhalation. Do you know if that is indeed what was his proximate cause of death? SENIOR ADMINISTRATION OFFICIAL ONE: Well, thank you, Arshad. Frankly, we are not clear on the circumstances between the time that he got separated from his – from the rest of the group inside the burning building, to the time that we were notified that he was in a Benghazi hospital. And again, we were not able to see him until his body was returned to us at the airport. You can imagine that we will not be able to say anything about the cause of death until we’ve had a chance to perform an autopsy. We have nothing further to this at this time. According to the State Department rep, there is currently no time frame as to when the results of Steven’s autopsy will be released.